I was going to title this post 'New beginnings' but that would have been redundant and repetitive. So was that sentence... 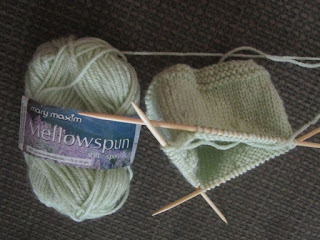 Anyway, this is about the colour green and they are new projects - hence the title. I've been in a bit of a slump and I needed to make something that could be finished quickly. This is a baby quilt (for the charity) and since I have so much fabric, I decided to cut up some 5 inch white squares and after looking on my shelves, I found a whole lot of greens. I needed to put the yellow in there. It will have a yellow border all around and I plan on hand quilting it with Xs (or diagonal lines going both ways.) I don't think this is the end since I pulled a bunch of turquoise (or teal) fabrics and another pile of blues. I was thinking of pinks and reds too - with maybe a bit of orange thrown in. Green again - but a nice soft green. My friend Marg has been crocheting hats and has put me to shame. So far, she has made 54 and counting... I picked this up yesterday and will hopefully complete it by the end of the weekend. I'm off to a quilt show this weekend in Lindsay and am hoping to take a few photos for inspiration. 54 hats - wow. 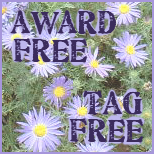 Your friend deserves an award! 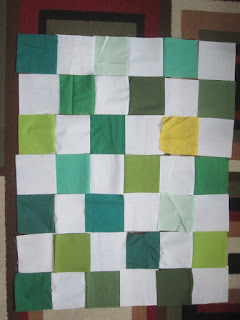 Good idea making a patchwork quilt in many colours. Lovely charity projects. . I'm in kind of a slump too and need a quick something. I don't play with green. I have a slight problem detecting different shades of it so I can make a real mess when I try. (My landscape watercolours are nearly always heather moors or autumn based!) I admire anyone who can make it look good.